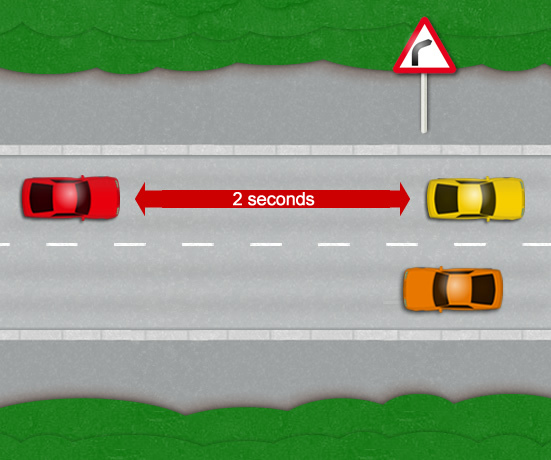 The 2 second rule is a method used to gain a safe following distance at any speed and is also an easy system for all drivers to remember and to put into action. The rule is very simple and easy to understand by using the description and diagram below. Remaining at least 2 seconds from the vehicle in front will provide a distance of one car length per 5 mph, at which ever speed you drive. The 2 second rule is used regardless of speed because the distance between your vehicle and the one in front will extend the faster you travel. Using the 2 second rule helps to significantly reduce accidents or reduce collision damage if one occurs. Using this rule provides not only a general safer way of driving, but can also help to save fuel, brake wear and paint damage as a result of stone chips occurring due to driving too close to the car in-front. See how to save petrol for further information. The 2 second rule should also be utilised by the learner driver as the driving test examiner will most certainly fail your driving test for driving too close to a vehicle (tailgating), or remaining close to the vehicle for too long. Although the 2 second rule applies at any speed, it should only be used on dry roads with ideal driving conditions. Other rules are detailed below. You are driving along a relatively straight road. To estimate the minimum and safe following distance, allow the car in front (the yellow car) to pass a fixed object. This can be any object that is easy to distinguish such as a road marking or lamp post, although in this case in the diagram, it’s a road sign. As the rear of the car in front roughly lines up with your chosen reference marker, count to 2 seconds. If before you have reached 2 seconds your vehicle has passed the same reference marker, you will need to increase your following distance and try again. The 2 second rule isn’t just for the car in front however. If a car is driving too close behind you (tailgating), you will also need to take their thinking distance into account by leaving a sufficient and safe distance between yourself and the car in-front. By following the 2 second rule, if the car in front of you brakes sharply, you will be able to slow down in good time, but also allow plenty of time for the car behind you to slow down. It’s also essential to learn safe braking techniques such as progressive braking. Progressive braking once learned allows for safer driving and less wear and tear on your vehicle. What is the 4 Second Rule? The 4 second rule is essentially the same technique as the 2 second rule, except 4 seconds are used due to weather / road conditions. Generally if the conditions are wet, the 2 seconds should be doubled to 4 seconds to allow for longer braking distances due to slippery roads. What is the 10 Second Rule? The 10 second rule should be used for more extreme weather and road conditions where far greater stopping distances are required. Use the 10 second rule where roads are frosty, icy or have snow coverage. Further information can be found for a cars stopping distance in various weather conditions, at various speed limits. Stopping distances are a necessary part of the theory test questions and is used alongside the 2 second rule for safer driving. It is important after these situations to impose the 2 second rule as soon as is safely possible, with safe regard to the vehicle behind. Thank you Nageswara. It’s always good to know that we are helping. The two second rule as illustrated can be very misleading. It is relative to speed. The picture shown would only be true if someone is driving around 25mph, not 55mph. It is far easier IMHO, to gauge the distance by the number of cars between you, instead of getting distracted and trying to gauge by a marker on the side of the road. The rule is therefore more safely accomplished by one car length per every 10mph. So, if you are driving 55-60mph, there should be six car lengths between you in normal driving conditions and even more in wet or other unsafe driving conditions, like heavy traffic. Yes it is relative to speed, which is why it works at all speeds. So at 25 mph, based on the 2 second rule this will be a distance of around 75 feet between you and the car in front. At 55 mph it will be a distance of around 165 feet between you and the car in front. Also, trying to work out car lengths whilst traveling at 55 mph is very difficult from the view of the driver. Simply choosing a marker that the car in front is passing and using the 2 second rule is far less distracting than trying to work out car distances from an awkward angle. I find that even at 3 seconds in the dry, my Zafira needs an emergency stop if the car in front slams on their brakes (stopping distance of 105ft from 30mph on level ground and dry). Ironically I have learnt that for small hatchbacks, such as Abarth 500 or other small hot hatch things I should be 5 seconds behind but never closer than 3 to anything, regardless of how good the conditions are, anything sporty can stop on a dime. I general I’m 3 seconds avg dry and 6 wet, although my wet 30mph stopping distance is 125ft, only 20ft more than dry.